Today I’m proud to announce the release of my third novella in the Sweethearts of Jubilee Springs series, a multi-author sweet historical series. 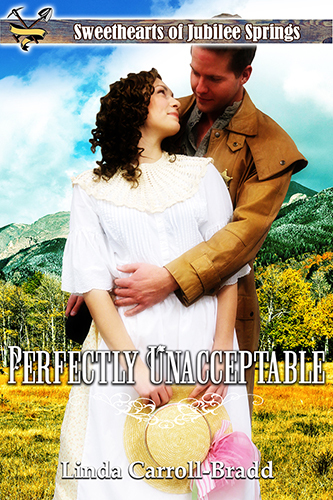 Perfectly Unacceptable shares the story of the cousin of Aurelia and Rilleta, the heroines of my first two titles. An interesting fact about the story. I always look for a topical event from history to include in my stories. As I built the hero, I realized he was pragmatic, quoted Benjamin Franklin often, and lived by selected precepts of Franklin’s writing. When I discovered that women’s equality advocate Elizabeth Cady Stanton had publicly decried Franklin, so of course my heroine had to be a Stanton devotee. I had such fun searching out meaningful quotes. BLURB: Jared Manning was left wanting on two prior marriage attempts, and this time he wants to be assured of a bride. So he commits to a correspondence courtship with only one potential mail-order bride and anticipates the arrival of Dina Valdis, a retiring schoolteacher, in time for the town’s Harvest Dance. He knows just how he wants his picture-perfect married life to be and assumes he’s found the perfect woman to fulfill the role. Dina is passionate about being a schoolteacher who sparks the love of learning in young minds. An incident in her hometown of Kingston, New York forces her from her job, and her reputation is smeared. Not wanting to become a hermit, Dina is reminded how her cousins, Aurelia and Rilleta, found happiness with their husbands in Jubilee Springs. Thinking this is her only option, Dina heads west as a mail-order bride. Seeing the size of the tiny town almost sets Dina running, but an attraction for this handsome miner keeps her there. When she learns the town’s children have no teacher, she starts a campaign to educate the townspeople. Soon, she’ll have to decide if the attraction she feels for Jared is stronger than her passion for teaching.